Saxophonist and composer Joseph Jarman was born on September 14, 1937 in Pine Bluff, Arkansas. Jarman studied music with the famed Walter Dyett at Chicago’s DuSable High School, a teacher whose other pupils include Nat King Cole, Bo Diddley, and Dinah Washington. While serving in the U.S. Army during the mid-1950s he switched to playing clarinet and saxophone. After his discharge from the military he went to study at Wilson Junior College, and there met saxophonists Roscoe Mitchell, Henry Threadgill, and Anthony Braxton, along with bassist Malachi Favors. Roscoe Mitchell introduced Jarman to pianist Muhal Richard Abrams, and together they formed group and began to rehearse and became the Association for the Advancement of Creative Musicians in 1965. In 1966 Joseph Jarman lanced his solo career releasing the two albums on Delmark “Song For” (1966) and “As If It Were the Seasons” (1968), but the group disbanded in 1969 after the untimely deaths of both his pianist Christopher Gaddy and bassist Charles Clark. 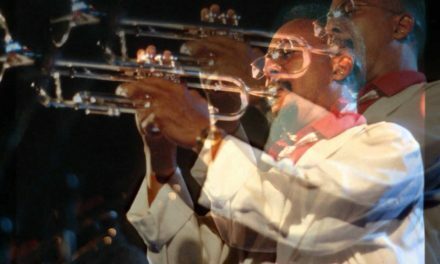 A short time later Jarman joined Roscoe Mitchell, Malachi Favors Maghostut and Lester Bowie to form a group that eventually became known as the “Art Ensemble of Chicago”. -Their motto: “Great Black Music: Ancient to the Future”. The “A.E.O.C.” moved their base of operations to Paris, France where they remained for a number of years before returning to the U.S. in the late ’70s. An interest in Eastern philosophy prompted him to peruse the teachings of Zen Buddhism and aikido. Joseph Jarman now has the title of Jodo Shinshu priest and holds the rank of fifth degree black belt with his own dojo in Brooklyn, New York called “Jikishinkan” (or direct mind training hall). The “Art Ensemble of Chicago” perform at the Berlin Jazzfest on October 31, 1991. Joseph Jarman’s solo begins at 4:49 after Roscoe Mitchell’s.